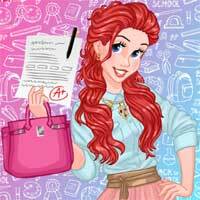 Hey, girls Do you want to spend a day at the college with the most popular princess Ariel Then, let�s start! Today Ariel is going to have classes and after a long study day she is going to meet with her boyfriend. Girls, Ariel needs your help to pack her bag, while she is working on her makeup. Take all the necessary things and put it in her bag. Then, help her to choose the trendiest outfit and go to the college. You will have a chance to attend the real college class. Your BBF Ariel needs to send SMS, but the teacher is all around her. Help the princess to do it fast and not to be caught. Did you do it Sweet! Now, when all classes are over, you can go with Ariel to meet her BF and have the most wonderful date after the college day. Have fun with Ariel and a real day at the college!